Facebook's Sheryl Sandberg is sharply criticizing President Trump on abortion policy. Trump on Monday reinstated a restriction known as the global gag rule that blocks nongovernmental organizations around the world from receiving American foreign aid if they perform abortions or discuss them in family planning. Reproductive care providers said the restriction could have catastrophic implications for women around the world. Sandberg, Facebook's chief operating officer, made clear in a Facebook post Thursday that she shares that view. "We don't have to guess -- we know what this will do," she wrote. "The last time the global gag rule was in effect, research showed more women who lost access to contraception had unwanted pregnancies and abortion rates doubled. The best way to prevent abortion is through more family planning services, not fewer." Sandberg wrote that she began her career at the World Bank, working on health care in India. There she witnessed how clinics that rely on foreign aid are critical for women seeking health care. The global gag rule has been enforced off and on since 1985. Democratic administrations have traditionally rescinded it, while Republican administrations have reinstated it. Even during the Obama administration, U.S. law banned direct funding for abortion services. But organizations that performed the procedure were allowed to receive aid for other programs, including those related to contraception access and post-abortion care. Related: Will Mark Zuckerberg run for office? Sandberg called for reversal of the global gag rule through a bill introduced by Representative Nita Lowey, a New York Democrat. "Women's rights are human rights -- and there is no more basic right than health care," she wrote. Sandberg started the Lean In movement to encourage women to step up as leaders and support each other in the workplace. She was a vocal supporter of Hillary Clinton. She was also one of the tech leaders who met with Trump in December. In her post, Sandberg did not mention the Women's March on Washington, the day after Trump's inauguration. 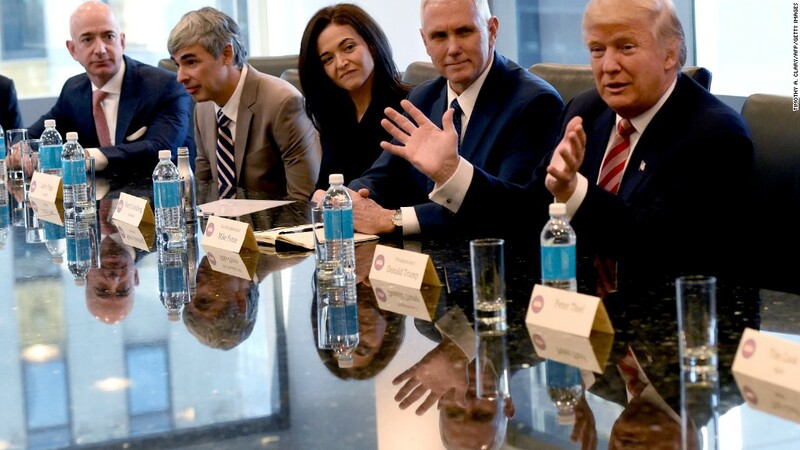 Sarah Lacy of the Silicon Valley news site Pando had written earlier Thursday that Sandberg's "deafening silence" on the march is problematic, and argued that Facebook "is bending over backwards to embrace a Donald Trump world." Facebook's relationship with the Trump administration is complex, to say the least. Peter Thiel, its longest-standing board member, was a vocal supporter of and donor to the Trump campaign. Thiel was a member of Trump's transition team and helped wrangle tech leaders, including Sandberg, for the meeting in December.